Worrying more than usual, fearing what might happen more than the average person, preparing for the remotely possible even if others don't. For the phobic and uberphobic among us, this is a way of life. And it's not easy. We have to be faster, quicker, smarter, more clever - to do just the typical-all-in-a-day's-work things, like turning left on a yellow arrow across four lanes of traffic at 5 p.m. on a Friday night. Not easy. But, through the awesomeness that Aiming Low is, they give me the space to write up aaaallllll my secret tricks to making it work. Today, brought to you by Aiming Low, Better Living Through Phobic Efficiency. Have hope, my dear tribe, it can be done. The first thing on my mind today is Finally. Rain. I want to tell you how exciting the air smells right before a storm. How at the end of thunderous lightning and a pounding downpour, I can almost feel the day sighing, like a toddler spent from his tantrum. Our lawns are equally, deeply green now. From those who closed their eyes to the pale straw-like blades that crunched beneath their children's bare feet to the ones who bit their lip at the sight of the dying turf when they'd pull into their driveways. Under the cover of darkness, they'd sneak in an extra sprinkling and a prayer before locking their doors for the night. Rain was the great equalizer this week, and those whose lawns were once akin to hay feel redeemed in their faith that we'd all return to the verdancy of spring's end, and the ones who anxiously tended to their ailing, parched shoots feel relief at no longer having the sole responsibility of life heavily on their shoulders. But talking about the weather means you've already run out of things to say, and I'm not there yet. --Sadly, Neil Armstrong passed away this week. My Neil-loving children were heart broken, and this tribute here is one they watched many times this weekend. How can we not cry at the passing of this humble man who walked on the moon?, is how I'd express it. Though "ben" on this site, said it best: "Dude could land on a rock blindfolded with 10 secs of fuel left and not have a pulse rate above 50. What a ride." --It's been brought back to life! While clothes shopping with my teens this week (post worthy, I assure you) I fell over from jumping up and down when aeropostale and american eagle had front-and-center mannequins dressed in THE DENIM SHIRT. The wild, wild west is back and since I never did get rid of the denim shirts I love, this is going to be the cheapest fashion season ever. And the one time I'm not late to the party. --From The Happy Logophile, a post on remembering our manners when visiting other people's blogs. No one makes us click over, so let's keep in mind that we are visiting someone's virtual house. Wipe your feet and don't leave a mess behind. Hoping you had a wonderful weekend. Sensationalism in that post title? Not really. The internet did save my mental life. Since logging on four years ago, I have found friends, become happier, skip instead of walk, and wear a lot more red than I used to. I've donated half the black blazers in my closet to Goodwill and replaced them with Smiley-Face T-shirts. All because I've found my place in this world through the internet. Care.com sent me a very welcome request to be interviewed for their Being A Social Media Mom series: 5 Moms Speak on How Social Media Has Changed The Face of Parenting. Once I made sure that this meant they weren't looking for technologically literate social media moms, I excitedly said yes. This interview series is an interesting look at the pros and cons of social media and whether it affects our lives as parents. My take is this: I wish for anyone who feels out of place, unheard, lonely, lost, wishing for a sense of belonging and connection, to take that jump on the internet and follow some blogs, or start their own. I'd love it if you'd click over and read my story at Care.com, as well as what the other women interviewed for this series have to say about Social Media and their role as mother. I can't say it enough times and in enough places: I love you guys. My kids are headed back to school. In just a few more days I'll find myself alongside them, hopeful for the new school year; that this time I'll learn the ways of the world, like, how to play well with others and not run with scissors. I'm sure I'll fail once again. My post is up today at Aiming Low, where I share how I feel about my three boys no longer being within an arms' reach of me in the morning while I chug (I've never been a sipper) my coffee. This one's for you, my babies. Brought to you by Aiming Low, New School Year Resolutions. My wrinkles are almost all gone. My skin has this--healthy--radiance. My eyes sparkle with life. Do I sound like I'm having a late-in-life baby? Has the GNC guy finally sold me something worth the $20 for 30 pills he's always trying to talk me into? After ten years of reading Prevention magazine, did I say Yes and jump on the drink eight glasses of water a day bandwagon? 3 p.m. no longer finds me drooling and head bobbing, begging for a nap. My mind is now quick, nimble, sharp. When I hold my arms up over my head during my 30 minutes of Body by Bethenny, my hands no longer feel like they're made out of 25 pounds of red clay. Each. Yes it is. And it's called SLEEP. Sleep is the drug and I need some more. For about 17 years now; coincidentally since the time my first baby was born, I have been falling asleep at the proverbial wheel. No place is off-limits; anywhere, in any body pose - I can do it. 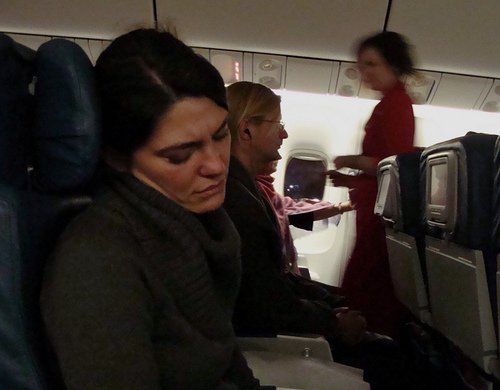 I can even fall asleep while you're talking to me and you'd never know I was grabbing a power-nap. "... and so then I said to him Zzzzzzzz ..."
Finally, during my last physical exam, I begged my M.D. to please do some blood work, because for months now, I have been feeling more tired than Rip Van Winkle. Tired like I'm sledging through knee-deep mud in a celebrity boot camp training exercise. I knew there must be some thyroid/cholesterol/red blood cells/glycohemoglobin/iron stores thing going on inside my body. Something must be at the root of my mid-sentence segueing into a snore. My Doctor's response was one I loved, "Well, you appear to be a healthy, well nourished female younger than your stated years (that was my favorite part). 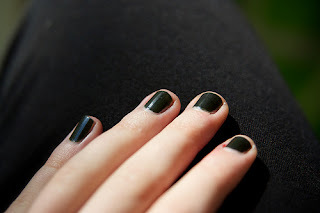 Your nail beds are pink and so are your inner eyelids. However, based on the look of concern you have on your face, I'll order some tests." Yee-haw. I grinned - positive that there must be an organic cause to my fatigue, something beyond the surprise baby at age 42. I offered my hand up to my M.D. in a high-five. Or at least I wanted to. In actuality, I was too tired to do it live, so I just gave her one in my mind, feeling much too listless to raise my hand up off my paper-gowned lap. My Doctor promised to call me as soon as the preliminary lab work was ready, which would be two to three days. Soon oh soon, I'd have that prescription of something that would give me back the pre-baby days of tireless, enthusiastic possibility. I couldn't wait and began taking notes for my eager beaver list of all that I knew I was going to get done: closet de-cluttering, yard weeding, photo organization, sparkling tile grout! Oh! the places I'll clean! The bloodwork was drawn on Monday, and three days after that would be Thursday. I circled Thursday on my calendar in red crayon. The Big Day. Awesome M.D. : Good morning! I've got your blood results here. I can tell you pretty quickly what's going on. Me: ::yawn:: Hi, Doctor. Thanks so much for calling. I've been waiting to find out. Awesome M.D. : Everything looks great. All readings within normal ranges. You are very healthy and the lab findings are right where they should be for your age. Me: Huh. Really. That's good news. Um ... I ... I just can't believe that everything looks so good and I'm dying here. Awesome M.D. : Well, are you tired right now? Awesome M.D. : How much sleep do you get a night? Me: Like, all the time? Or, on average? Awesome M.D. : Tell me how much sleep you get a night on average. Me: It's not a good answer so I don't want to say it. Awesome M.D. It's Okay. You can say it. No lectures. Awesome MD: Yeah. You need to get a lot more sleep than you do. You're tired because you're tired. Try seven or eight hours, and let's see how you feel. It'll make a big difference. Me: (so red-faced you can hear it) Will do, Doc. Thank you. In bed by midnight, up by 7 a.m. Seven hours of sleep a night and I have less anxiety. I have enlightenment and vitality. I have energy. I have awakened reserves in myself that I had forgotten I was capable of. I have become considerate and kind toward others and my relationships have improved due to this limitless amount of patience I've found. I handle conflicts constructively rather than the pre-sleeping response of and so what are you going to do about it? I have become tranquil, tolerant, relaxed. Naaah. I haven't. DNA is DNA. But I can promise you this--I look a heck of a lot better now than any jar of $50 eye cream could ever make me. No more do mornings find me packing the only Coach bags I'll ever be able to afford--the ones under my eyes. --Thrilled to be featured on mamapedia today, with a post where my pain will hopefully be the source of a smile for you today. Read about what happens when the cutest boy I'd ever seen in college tries to convince me to fall in love with him. Painful, but not too painful. I hope you stop by! Long overdue, but he was loving his summer. 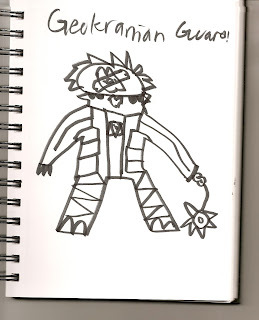 A post today from our youngest, "Baby E." His art sketch book is his source of pride, and the thing he wants to share with you. Thank you all so much for indulging him. I like the name of this post because the name says it all. See these pictures? 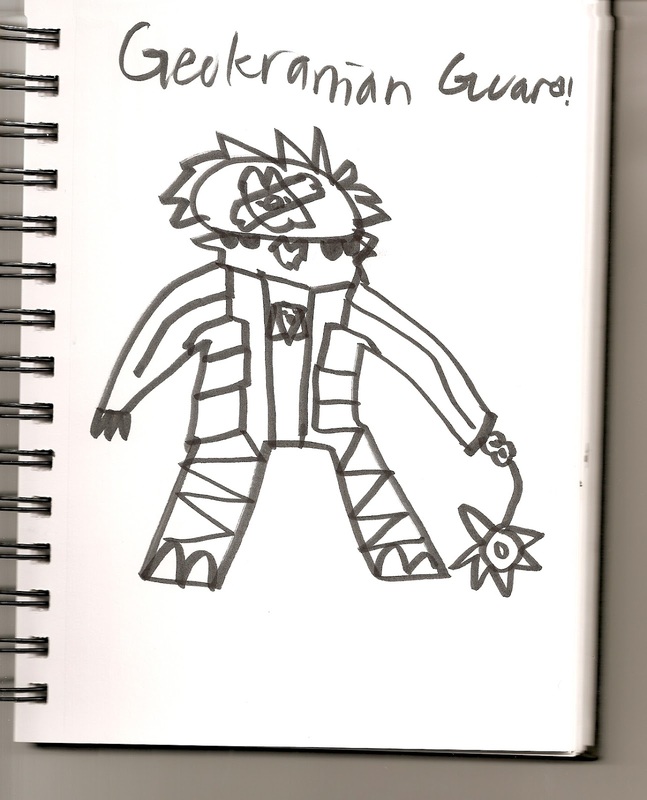 I drew them over the summer in the art sketch book my mom gave us on the first day of summer. 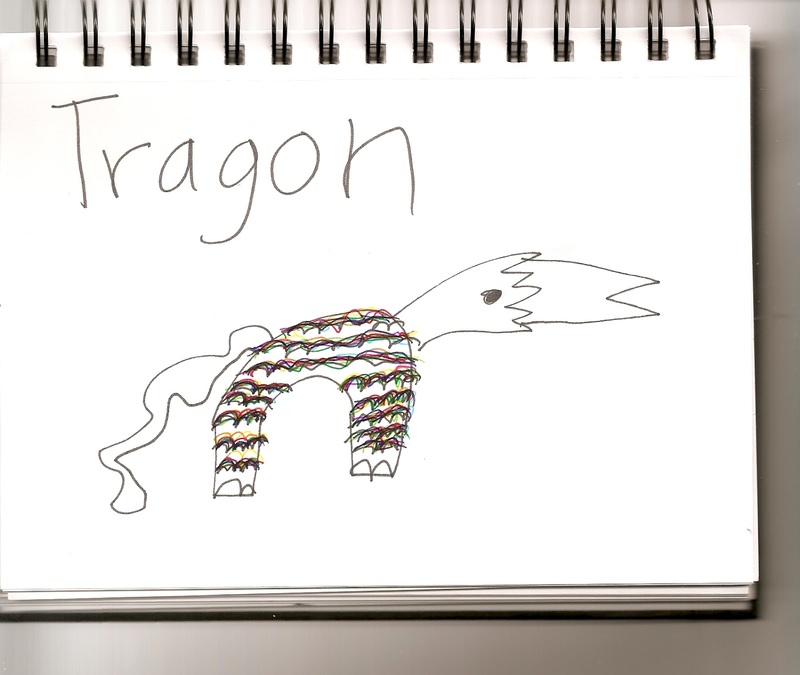 They are so good you might say "he traced them." 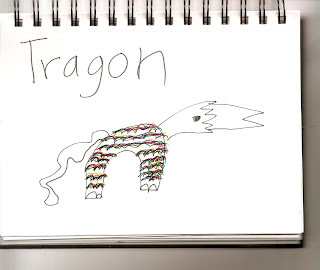 I did not trace over them or anything. All of them are from my imagination, from games I like. I thought this real life bee was really cute when I was really young and so I picked it up and tried to pet it and it stung me on my thumb. I drew this picture after that and called it Evil Bee. Cuz it was. 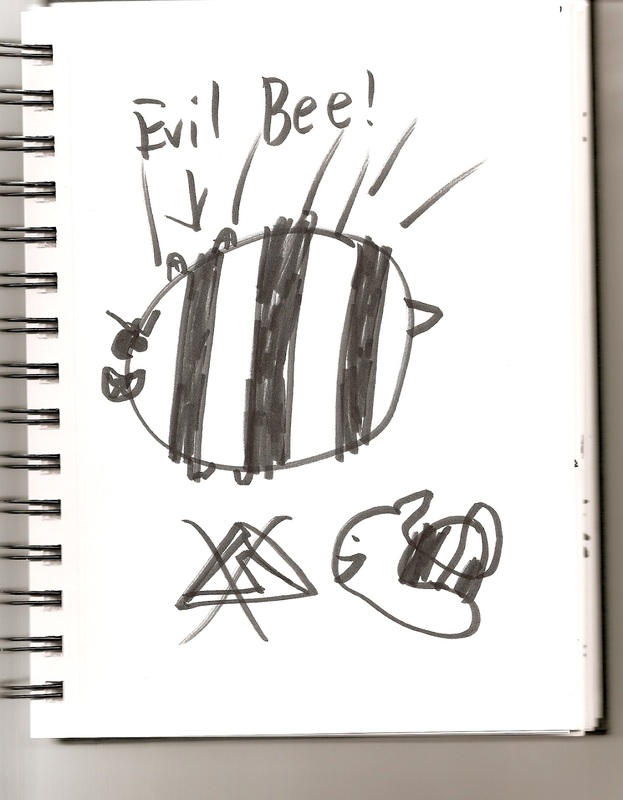 It was an evil bee. 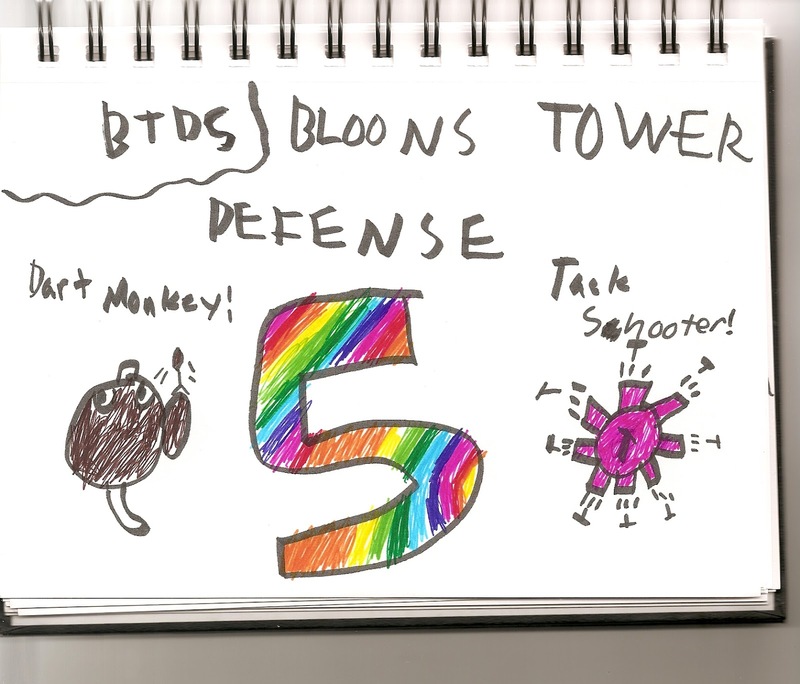 This is this game I like to play on the computer called Bloons Tower Defense 5. It's on NinjaKiwi (like the bird). 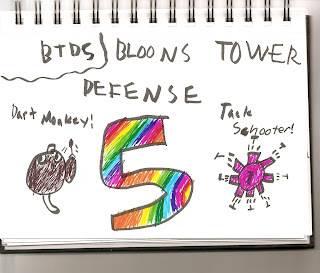 It's this game where's these balloons that come and the monkeys try to defend their village from the balloons. They make darts and tacks and surprise contraptions to shoot at the balloons and pop them. It's really fun. But tell your kids to NEVER click the ads or the videos. I like to make these things called Chibis. They're really cool. They're like these really cute things. Sometimes I go the extra mile and make them really awesome. Then I show them to my family and ask them what they think and the stuff I wrote around this Chibi is the stuff my family said. 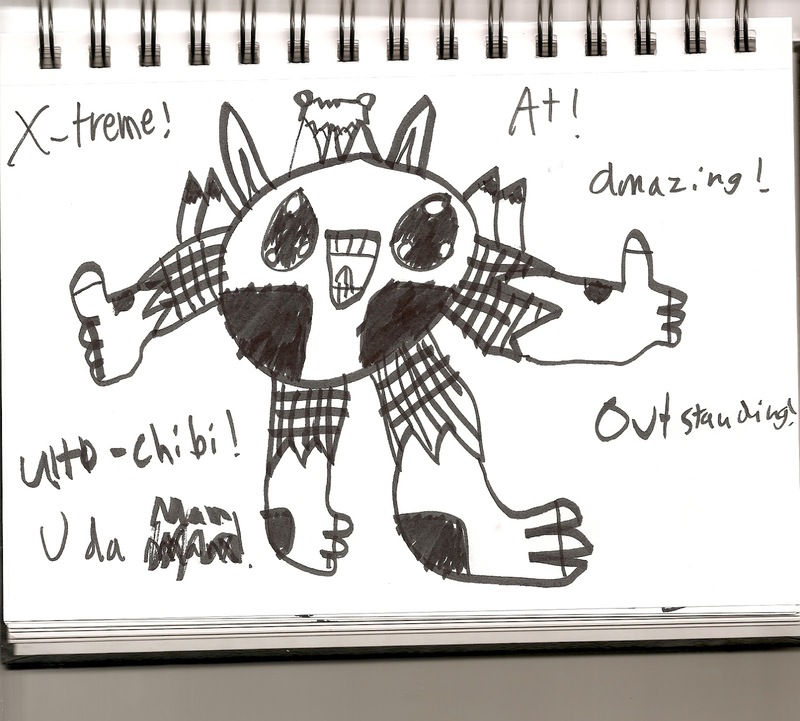 This is one of those ultimate Chibis. This is from another computer game I like to play but not so much anymore because I'm older but it's pretty good if you're nine and below because they have captures and special missions and stuff. I may not like the game anymore but I still really like the guys so I still draw pictures of them. 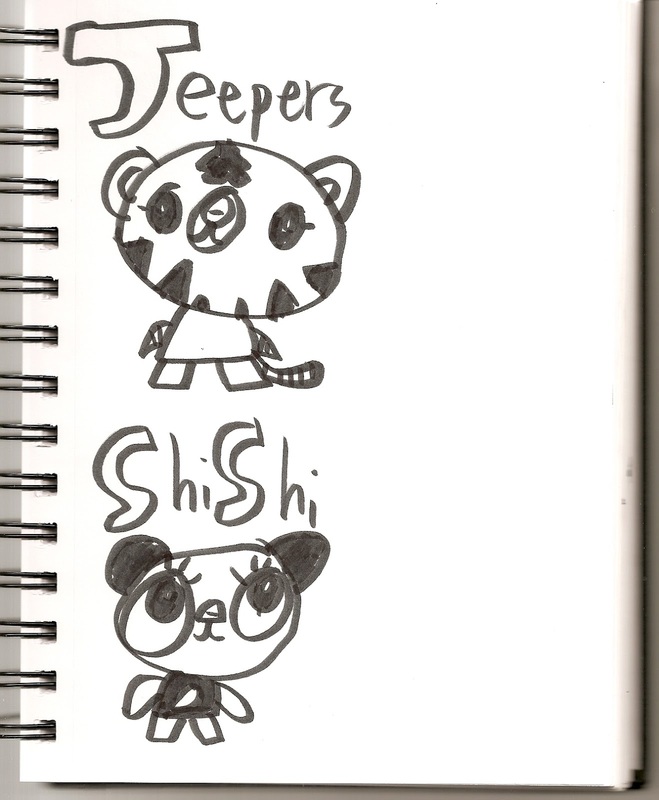 It's called Moshi Monsters. 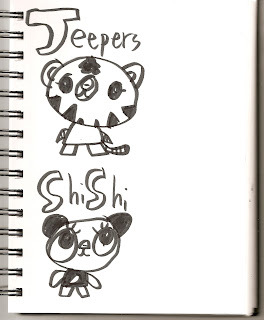 These two guys' names are Jeepers and Shishi. You know those Geokranian guys up there? Another cool thing is they have this cool awesome huge-like beast god sort of thing that lives in the middle of their planet and it's incredibly powerful and it itself is as big as 3 suns. It's huge and whenever the world's in trouble this thing comes out and just destroys whatever bad thing it is. I made his name up, too. That's some of the stuff I drew over the summer. It was fun to show you and especially to write the captions. I think this is one of my best posts ever. Signs of the apocalypse: I've got my In Case You Missed It up on a Sunday. Before noon. Hide your kids, hide your loved ones, that fireball from the sky is coming down fast. --I subscribe to storyfix.com , an excellent online resource for novel/short story writing tips and fundamentals. This piece here, on deconstructing story structure, is a keep-for-always post: "The Story Structure Demystified." Essential how-to of drawing a reader in. --And some news we can celebrate when it happens to someone who deserves it: A book deal! See who's the latest to have landed something sweet: so very happy for you, dear lady. Much overdue and can't wait to read it. Happy reading and enjoy your Sunday! Facts of Life: if you are or have ever been a human being, you may have had moments in your life of anger so intense you feel mind-leaving-body, and you are witness to the separation. Like eyes rolling around in your head and steam coming out of your nose like a stomping bull white hot anger. Feelings boiling over like a screaming tea kettle on the stove, and what do you do with yourself? Especially if these emotions overtake you at a less than opportune time: say half the town watching? *Ignore them maybe they'll go away, is not one of my suggestions. As my three children watched footage of men in their 80's and 90's, some wrapped in blankets and being pushed in their wheelchairs, they told me it was hard for them to imagine that these were the same men from 70 years ago that they were now watching on film, talking of storming a beach, pulling dead or wounded to safety, flying overhead and dropping bombs, driving tanks through ruined city streets during World War II. Yet here these men were-- lined up, one proudly saying, "I'm glad I was able to stop America from ever looking like what I saw." The event, called “Field of Honor,” was held at Miller Park in Milwaukee, Wisconsin, on August 11, 2012. A record breaking crowd for the largest film screening in history of over 30,000 came together to see the documentary, Honor Flight, in the company of living World War II veterans. All 33,000 tickets were sold for the event that featured the premiere of this documentary, about the Stars and Stripes Honor Flights that provide free trips to Washington, D.C., for World War II veterans, their goal to transport America's veterans to Washington to visit the memorial dedicated to honor their service and sacrifice. This past Saturday my children were there and they watched the film showing these men from WWII get ready to board 747s that would take them to see the WWII Veterans Memorial in D.C., paid for through donations of a project called "Honor Flight." The documentary provides the narrative to each of their stories. As the men boarded the planes taking them to Washington, they had the same determination to get on this flight as they did when they entered the war 70 years ago. Despite wheelchairs, walkers, crutches, you see the resolve they have to get on this flight. As one veteran is wheeled on, he says, "Okay, here we go, just like we did before." 900 World War II veterans die every day, most of them without ever seeing the War Memorial built in their honor. These soldiers fought protecting America, and the fortunate ones who came home, stepped off the planes and went on to live their lives. Some to never talk about what they had seen. But at first sight of each other gathered together in D.C. at the memorial, the floodgates of what they lived through, open. The documentary shows the now time-weathered faces of the men who fought years ago, and in being honored in this magnitude, the bravado of the nineteen-year-old-boys they were at that time returns, "You shoulda seen us when we were younger!" one vet says to the camera. Honor Flight is a feature-length documentary that chronicles a community coming together to honor living World War II veterans. The film follows a devoted team of Midwest volunteers as they race against the clock to send every local WWII veteran to the Washington, DC memorials built in their honor. Honor Flight Stories is a movement to help preserve the stories of the Greatest Generation and honor their legacy. The film Honor Flight is a feature-length documentary produced by Freethink Media. Through the end of 2011, more than 81,000 WWII veterans were flown to Washington, D.C. to see their memorial. I am so grateful that my children were among those present this past Saturday night to honor and greet our veterans at Miller Park Field, with a standing ovation. Melanie Crutchfield, who blogs at melaniecrutchfield.com, came up with this inspirational idea to spread some positive change in the world. She decided to blog, and invite others to blog, about HOPE. 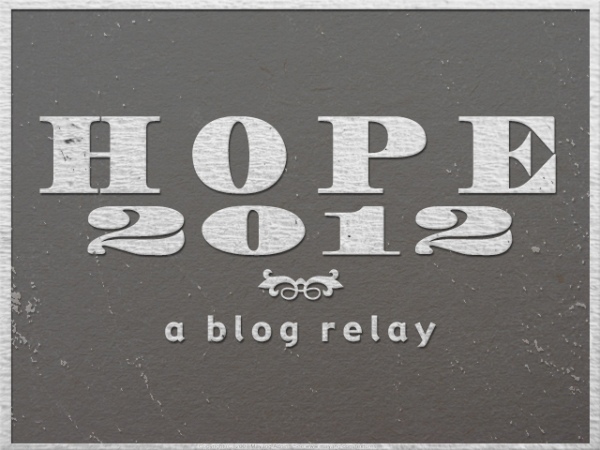 So far, there are 52 blogging writers participating in Hope 2012: A Blog Relay. The posts linked up so far are deep-breath awakening and leave me feeling ten feet taller. Today, there are 53 linked up. How could I pass up an invitation to write about HOPE? I've never written about what this word means to me. Just the thought of HOPE is a personal, beautiful, intensely private, defined one. No one can tell you what hope is to you; only you know what it means in your life and what it has done for you. I have been fortunate enough to have held hope in my arms at a time where I can say it is the only way I lived through a season in my life. We use the word hope every day, loosely. We say it when we hope to find a parking spot; we use it more earnestly when we hope we have enough money to pay our bills for the month. There are the moments of hoping that what we've put hours of work toward, we see rewarded. Are there degrees of true hope? Not for me -- hope can be a positive state of mind, of being optimistic -- hoping we get rain for our dry lawns. Hope can be realistic, knowing we stand a good chance of arriving somewhere on time or getting a piece we submitted published. But it's the personal experience I've had with a certain kind of hope that makes me feel that hope is not on a continuum, that it's not a dash marker on a spectrum. It's the hope that comes with desperation -- where you find yourself saved only by the thought of rescue -- that defines hope for me. Emotional, financial, or physical forms of hope; I think of trapped miners, parents with a child in NICU, someone waiting to hear back from the fifth or eleventh job they've applied for in a year. For me, it is that hope of desperate belief in something when you have nothing else, that pulled me through one of the blackest periods of my life -- my post partum depression when I became a mother for the first time seventeen years ago. I needed that kind of hope or I wouldn't survive; I needed that hope to hold me up and promise me a tomorrow. Even though it was seventeen years ago, the graveness of that time in my life makes it feel as fresh as if it were last week. There was a nurse from the hospital who cared for me in the days after I first brought our son home; she sensed something wrong, and checked on me. It was her; the hope of a nurse who somehow saw what no one else could see, saying to me, in the loudest voice possible without screaming, "I promise you, you will get better," that saved me. I wanted that promise of getting better and to believe her. My God, I was scared enough to. But what was I going to believe? Was it her promise that was my hope? The part of me too scared that I wouldn't get better shouted back that no-- I won't be one of the lucky ones. I was afraid to believe in case she was wrong. But I had to. Through the roaring of giving up in my head, I heard her tell me I would get better; but it was me that had to decide that I either would be or wouldn't be, one of the ones who made it. I remember that very moment when my son was five-weeks-old and I sat on our sofa, holding my baby, talking to my nurse who came to see how I was -- me, not even able to talk, but only sob; and she understood what I couldn't say. I heard her voice break through the deafening defeat in my mind with the word "promise," and then, somehow through the fog I was imprisoned in, something in my heart clicked on its own, and my pleading soul took on the fight for me and my baby and believed what she was telling me. What I felt was beyond a state of optimism, it was far more forceful and powerful than positive thought or statistical probability. It was the belief that she was right. I would get better. I had taken that HOPE into my dead heart and made it mine. From then on, I knew I had to wake up every morning and claim that hope for me and my son. I believed that living spark of knowing that I saw in my nurse's eyes when she looked into mine. I still feel that white hot commitment to hope when my soul took hope at its word and planted it deep, giving it no time limit or ultimatum for when. I accepted hope on its terms and believed in its promise. Hope gave me determination and became that tangible thing that I clung to when I was barely hanging on to sanity in those earth shattering early weeks of being a new mother. I held onto it by the tips of my fingers and never let it out of my sight. Hope made me sure to look at my child with a smile on my face -- always. Hope led me to the library to find CDs of Broadway show tunes so I could learn songs to sing loudly, happily, earthily, to my child. One morning, as I sang "Oklahoma!" off-key but with my whole heart, my son smiled at me. He was ten-weeks-old, but with his first smile, he showed me how beautiful and indescribable, hope is. Bit by bit in the days to come, hope kept showing me flashes of gifts of what life is like when hope survives within you. It is this gift of hope that is flesh and blood real to me. When I speak to New Mothers' groups, I talk honestly about the slow, struggling climb out of the depth and darkness of my early days as a new mother, about the pain of hopelessness. I tell them, in a voice that still breaks from the fierceness of the memory, my true unprettied up story from the past with the hope that they'll believe this seemingly put-together woman standing in front of them, when I confess about the days when I thought I'd never get better. That once, I was right where they are now. When I look out, teary-eyed, into the faces of the women sitting in front of me, I see them listening -- their desperation for belief in my words so clear, in the same way I wanted my nurse's promise of hope for me to be real -- like it's the only thing we have. I beg them, in the loudest voice I can without screaming, never give up, never give up HOPE. Pass along the HOPE 2012 torch. Blog about hope, ask others to blog about hope. Ask them to ask others. Let melanie know of your post, and link it up here. Then set some quiet in your day aside to spend reading on melanie's site about what others have to say about what hope is in their lives. Let's recognize and celebrate how hope has held us up or pushed us through. Write your stories, share them with us. We can't wait to read what you have to say. **Melanie Crutchfield will gather up little snippets from people who wrote about hope, so make sure you link back to her as the originator of the relay. **Update: Friday, August 10: At last count there are 81 posts in HOPE 2012, and at least 196 people invited. Closing ceremonies on for Monday, August 13, so there’s still time to write if you want to! Go write, you crazy people! Write! Home oh sweet home and how good it feels to sleep in thine own bed. There is such joy in coming home after having to spend four suffocating hours on a LaGuardia runway because of hull ripping 80 mph winds with nothing but water, a bag of pretzels, and a shared peanut chocolate bar from a generous and compassionate fellow BlogHer conference goer, Ann Imig. Ann and I arrived back in Milwaukee four hours after we were scheduled to due to *bad weather* read: ominous grey clouds that'll have you bouncing around the inside of an airplane like the rubber ball at the end of a paddle. Our plane thumped and landed on the Mitchell Field Airport runway, skidding to a stop after hours of sitting helplessly on a plane while getting texts from my three kids so at the end of their rope of being without me that their texts sounded like this, "help me mom he's stealing my french fries!" and "he just hyperextended my finger!" I wanted to touch down in Milwaukee as soon as I could and go back to refereeing their fights and snapping their dislocated phalanges back into place. My heart sang at the sight of my three boys waiting for me at the airport, especially the littlest who still runs at me like he just spotted the train at the zoo. The hugs, the kisses, the smiles, the sentiments of "we missed you, mom, how was your trip?," along with the confused looks on their faces when they saw me and Ann walk step-for-step down the ramp together in unintentional matching sister-wife maxi dresses; "they made you wear long dresses to the conference, mom?" were just what I needed after being away for almost a week. My smile lasted exactly the 50 minutes it took to drive home from the airport to our house and then walk in through our back door. The first thing I saw after I walked into our kitchen -- dead daisies in a vase full of grey slime water -- should have been my tip off. I didn't want to start in right away, but what in the world?? No one smelled the Milwaukee Sewer Company in our own home? Mark, you couldn't have thrown out this reeky water in the vase?? You didn't have it on the must-do list. What?? Mark -- Really? Wii all day? Oh, no. No. I wrote down 30 minutes max, especially for the little guy. No. Well, at least he took you out of the house every day. And it does look like your dad tried. I mean, he did a nice job of keeping up with the laundry; there's no piles. MOM! Oh my gosh. He kept up with the laundry piles because there were no piles to keep up with! He NEVER DID THE LAUNDRY. We had to sleep in our gym shorts. I'll take care of it now -- it's okay. There's no dishes all over the counters and I appreciate that. Did someone break the dishwasher door? Looks like it won't close. That's cuz it's stuffed with dishes, mom! Dad never did them and he stuffed everything in there two minutes before we left to get you. We had to eat out of the baby bowls of ours you're saving from when we were little for us to give to our kids. I looked up for my husband, wanting to be fair and hear his take on things, also secretly hoping it wasn't as bad as the reports coming in. But he was already sacked out on the sofa, flat on his back, and sounding like a twin engine. He was off duty, wiped out, and the kids were lined up to talk to me, waiting their turn to whisper their list of transgressions and sins done against them in my BlogHer absence. I listened to each of my children, holding individual confessionals, so hungry were they for my validation of how they were wronged. The oldest told of how his dad never let him drive, the middle guy stammering about how he was both made into Cinderfella and an airport dispatcher for relaying phone messages, and the youngest: hopping on both feet begging for "some real food tonight, okay, mom?" With my sleeves rolled up, I headed for the kitchen sink and began rinsing and washing down the dishes I was pulling out from inside the dishwasher. The youngest watched, mesmerized: "Look how long you rinse, Mom. All the dishes dad did while you were gone had brown spots and streaks on them and I'd just put them back in the sink and not feel like eating any more." I have been home two hours, and the laundry is washed and folded, dinner plates from home-made baked chicken and roasted potatoes are being scraped, and the kitchen table that formerly looked like Hansel and Gretel had passed through is now crumb-and-dead-daisy free. Two hours home, and things around here look less ravaged and Social Services Call Needed. Except for my black manicure. After just two hours, the polished nails which managed to stay spalicious for five days straight while in NYC now look like they belong to a teenage runaway working the dart throw at the local county fair my children haunted all week. And I thought the landing on the tarmac was the rough one. Thank you, BlogHer, for a fabulous conference. We got us a rock tumbler in the house. And I learned a thing or three that you need to know about this little so-called "toy" that every kid asks for at least once in their life. Life lessons, courtesy of my pocketbook, in contribution to the public good. My post today at Aiming Low, where the money you save will be your own -- unless you need an idea for a good post, then by all means, tumble away. What I can tell you about rock tumblers, at Aiming Low.